Students from Yoshimoto Kogyo Actors’ School play the roles of ‘majimun’ specters at Hapinaha’s haunted house. Hapinaha entertainment center that operates in the former Okinawa Mitsukoshi Department Store building on Kokusai Street in Naha celebrated its first anniversary on March 12th, and introduced a couple of new attractions to celebrate the occasion. The giant haunted house that occupies three floors from the fourth to sixth has now been renovated and now features a storyline that requires visitors to solve a series of problems as they proceed along the way through the attraction. 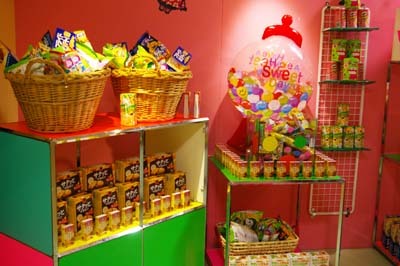 Visitors to Hapinaha’s ‘Candy Room’ have 90 seconds to grab as much Japanese candy and snacks as they can carry. The entrance to the haunted house is on the sixth floor where visitors first move from the third floor by an elevator. Moving in groups of maximum eight and led by a ‘majimun,’ they then proceed down to the fourth floor on a route that takes approximately 30 minutes. Along the way they are presented problems and tasks that they have to resolve, and earn ‘ishiganto’ talismans that ward off Okinawan ‘majimun’ specters and spirits and break the curse. Participants have to collect eight ‘ishiganto’ to clear the course. The route starts from the sixth floor that is dark and scary department store sales floor with plenty of goblins and ‘mijimun’ to give the chills and set the traps. Along the route on the fifth floor participants encounter two doors, of which they have to choose one. Behind one of the doors is a problem that takes brainpower to solve, the other leads to a task that requires physical power. On the fourth floor final stage the participants have to find their way through a maze of mirrors. 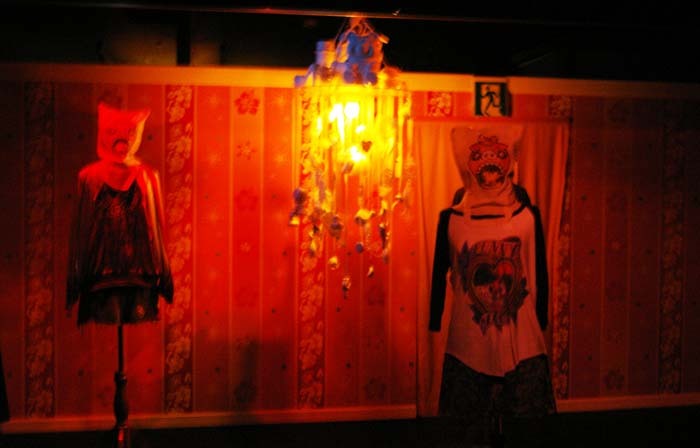 Hapinaha haunted house is open every day from 11:00 to 22:30 with the last entry at 21:55. Tickets to the haunted house cost ¥1,200 for adults, ¥1,000 for junior high school, high school, university and college students, and ¥700 for elementary school student. The tickets are available at FamilyMart’s Fami-port terminals and on the 3rd floor of Hapinaha. A temporary new attraction on the 3rd floor of Hapinaha is called “Candy Room” that is open through the end of March. People entering the room have 90 seconds to collect as much Japanese candy and snacks as they can get. The entrance to the Candy Room for one adult plus one elementary school kid cost ¥1,900. Each additional kid costs ¥700 more. Tickets are available at Fami-port terminals and the ticket counter on the third floor.